Mountain house plans deliver comfortable living spaces and panoramic views. They are designed for hillsides, sloping lots, and mountainous terrain. 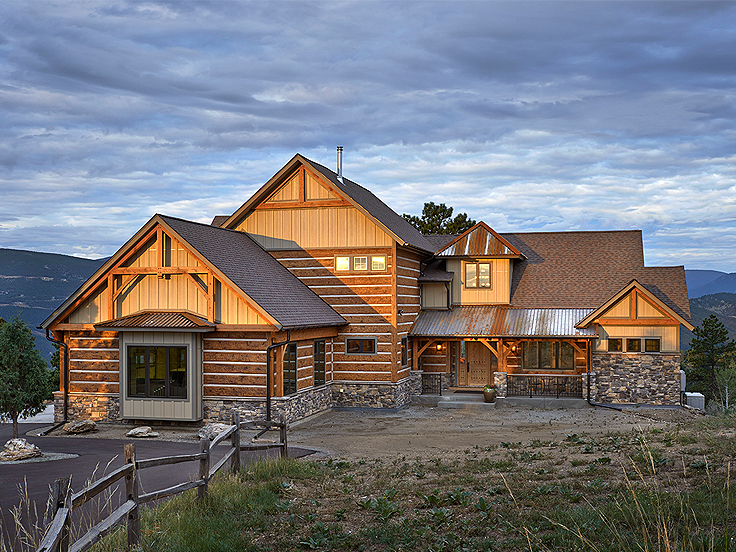 Take some time to review six of our featured mountain house plans below. 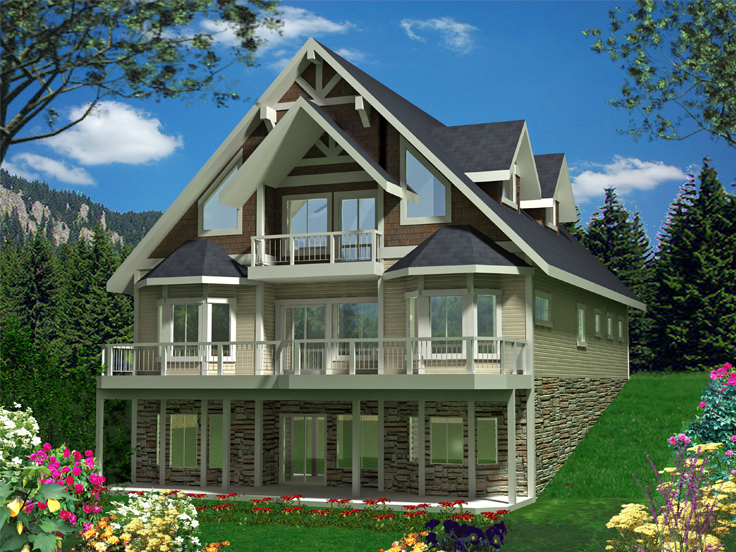 053H-0002 – If you don’t have a mountain to build this beautiful house plan, just about any sloping lot will do. Gorgeous inside and out, this plan will even please flatlanders. The floor plan boasts spacious volume ceilings, two fireplaces (one outdoors), stately columns and other decorative details. The main level enjoys an open floor plan featuring an island kitchen, great room with fireplace, breakfast nook and formal dining room. A “fit for the king of the hill” master bedroom presents a luxurious bath and two walk-in closets. The optional lower level is a walkout basement offering a wet bar to serve the rec room, media room, and office. Two bedrooms share a Jack and Jill bath. Enjoy the outdoors with views from the many windows, plus a deck and screen porch. 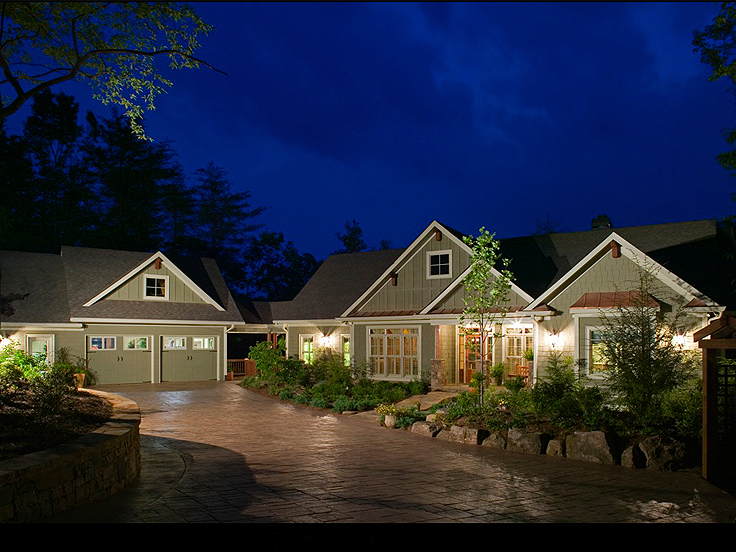 072H-0206 – Naturally, homeowners are interested in the creature comforts provided by this vacation-style mountain house plan. There are three bedrooms, a full bath, a kitchen with snack bar, laundry closet, a great room with fireplace, and a gorgeous deck. But one must concentrate on the beautiful views that this open floor plan provides. Look at that fabulous wall of windows! Whether you are on the first floor or second floor or outside looking in, the wall of windows is the focus of this design. Just image viewing the sunset or watching the wildlife outside your home. Long after you vacation is over, you’ll still be contemplating all that you saw through the sparking widows of this mountain house plan. 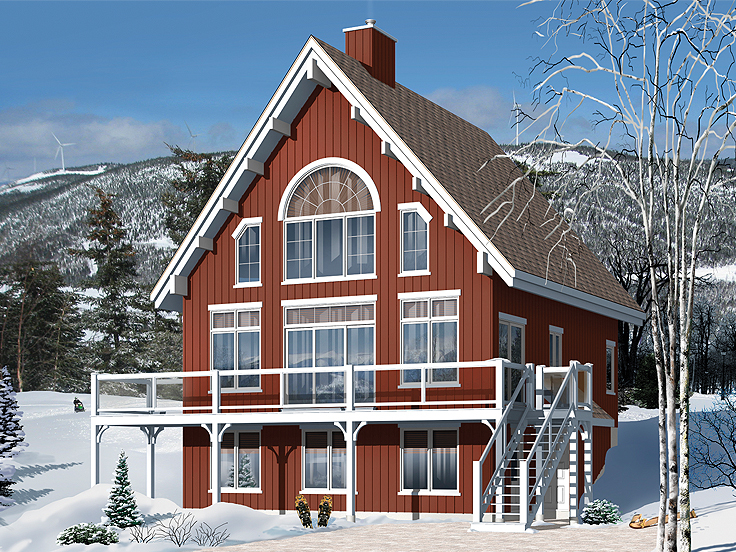 012H-0134 – Comfort and convenience are wrapped in the solid, attractive exterior of this mountain house plan. And open floor plan boasts a living room that is open to the second story above. Enjoy warming up by the fireplace on chilly evenings. Your master bedroom is located on the second floor, and it has its very own balcony for stargazing. Keep your overnight guests comfortable and happy with a guest room on the second floor. Entertain outdoors with a first-floor deck that cleverly provides shelter for the porch below. Plenty of storage space and a two-car garage complete this home plan. 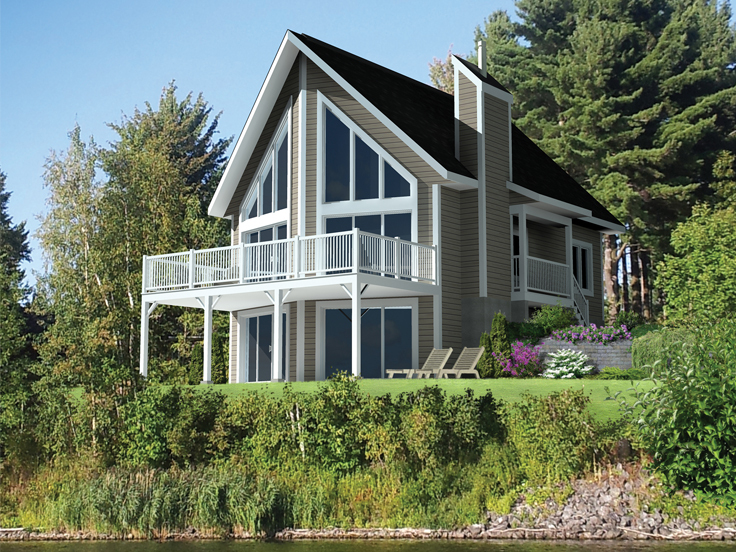 066H-0024 – This picturesque plan is pleasing inside and out. Notice the fabulous wrap-around deck, perfect for outdoor entertaining with your choice of panoramic views. Special volume ceiling treatments will have you looking up while an array of windows will have you looking out. Two second floor bedrooms enjoy their own baths and a measure of privacy. Read quietly in the study or play pool in the rec room. You can equip your own gym in the finished basement and start each day with a morning workout. Cozy up to the fireplace in the master bedroom or soak in corner tub. Both are perfect ways to wind down your day. This plan is so beautiful and full of exciting opportunities for enjoying life with your family, you’ll never want to leave home! 027H-0350 – Two stories plus a finished lower level offer comfortable living and sleeping spaces in this ski chalet. Sweet and inviting from the outside, this plan does not disappoint on the inside. The floor plan places the master bedroom on the main level, with two secondary bedrooms upstairs accessed by loft balcony overlooking the great room. On the lower level you will find two more bedrooms plus a family room for gathering and socializing. Snack at the kitchen snack bar or eat a meal in the dining area. Check the weather out on the main-floor deck and warm up at the wood stove. This is a perfect place to come home to and kick back, after a day on the slopes. For more mountain house plans like these, please view our entire collection of designs.